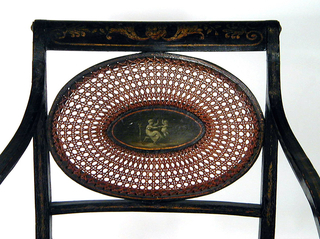 Curved and sloping armrests; top and lower seat rails include an oval caned medallion with a central oval panel painted en grisaille with a woman and child. Curved arms are received by stumps extended vertically to straight, tapered, turned front legs. 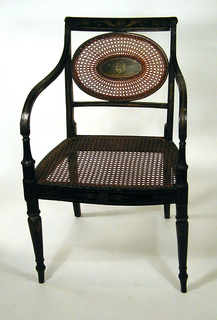 Seat caned, burgundy colored caning. Gilded and toned decoration of conventionalized flowers and leaves, and bandings, on black ground.